Terry Munson has come out with yet another useful guidebook for those who want to learn to use Chief Architect X8, the most recent version of the great Chief Architect Premiere professional 3D modeling software. This is the software I have been using in my 3D rendering and home visualization work since 2007. I and many others have found Terry’s books extremely helpful in getting the most out of a complex piece of software, so I’m happy to publicize his latest version. First off, I want to thank all of you that have continued to buy my books, year after year. Because of your patronage, I have continued to write the Chief Architect Step By Step Learning Books. This began with Chief Architect X3 and has continued to X8. I have also written 3 advanced books and a roof book, all still available for sale. “Residential Design Using Chief Architect X8” is now available for sale! This is the latest addition to the Chief Architect Step By Step Learning Books. What can I say? After countless hours of research and writing, I believe this is my best work yet! Not only does this book include all of the new tools and enhancements of Chief Architect X8, it also includes a different home design project than that used in any of my previous books. Unfortunately, the price for the book is going up, slightly. Sorry about that, but its the same old story you’ve heard before, costs go up, so price has to go up. But read on to see the extra value you will be getting with the DVD that is included with each book. I have really loaded this DVD. It now includes the X8 Workbook (a $40 value), and a new Study Guide (easily a $40 value). The Workbook has been rewritten and includes additional projects. The Workbook not only solidifies the user’s ability to use Chief Architect proficiently but also presents new tools and concepts through numerous step by step projects. I wrote the Study Guide because of several requests from teachers who teach Chief Architect. They wanted a more condensed version of my main book in order for their students to learn more quickly due to time restraints. So the Study Guide takes you quickly through laying out a floor plan, adding floors, adding a roof and decks, and touches a little on interior design. Even though you will now get “Residential Design Using Chief Architect X8” plus the workbook, plus the Study Guide, the price is only $74.95! But hurry! Only a limited number of books were published in the first printing. The price will need to go up for future printings of the book. You can learn more about all of Terry Munson’s Chief Architect Step By Step Tutorial Learning Books at www.chiefapprentice.com. Start the New Year off right: Learn something! Today I’m featuring a guest post by Chief Architect software user and author Terry Munson. Terry’s latest book for Chief Architect, “Learning Chief Architect X4 Step by Step,” has recently been published and is available at www.chiefapprentice.com/Downloads.html. My first book, Learning Chief Architect Step by Step, was based on Chief Architect X3. I then decided to write a new book focusing on the more recent version, X4 [released in July 2011], so that all the new features and enhancements could be included. So I now have two books for CA out, all in one year! And I’ve almost finished a third book, Becoming a Chief Architect X4 Expert Step by Step, which I hope to publish by March 2012. My intent with these books was to provide myself with readily available reference material on how to use the different tools and functions of Chief Architect software. I kept forgetting how to do certain processes and was always spending time searching for answers in Chief’s help materials. I’m a draftsman, not a writer, but as I got more and more into writing the book, I realized that others might appreciate something like this as well, which gave me even more incentive to keep writing. The book is a step-by-step tutorial that takes the user from setting up defaults and templates to actually designing a house from start to finish. The user will draw a floor plan for a 2-story house, add cabinets, fixtures, appliances, stairs, roof, dormers, floor and ceiling platforms, foundation, site plan, terrain features, and whatever else is necessary for a complete home design. The book takes the user from setting up construction documents to presenting the model in 3D. They work with materials, trim and moldings, etc. It is a complete and comprehensive book for beginning and intermediate level users. Material for the book came from various sources, such as Architectural Design Presentations (by Donald A. Totter), Working with Chief Architect (by Star Training Institute), CA’s reference manual and training videos, as well as from my own experience with using the software for the past 7 years. After a frustrating search for a publisher, I decided to self-publish the book through Gorham Printing. The books are very high quality print (black and white), with a very secure binding — good quality work. The softcover book comes with a CD that contains a PDF of the book (in full color), and includes the files needed for the exercises. Both books are also available in e-book format. One nice thing about the e-book is that I was able to price it much lower than the softcover book. When the first book became available, I got a rush of orders and was pretty excited. I got nothing but positive feedback for the book. Then Chief Architect’s academic dealer, Debbie Gray of Gray Technologies, called me. She sounded even more excited than I was about the book. She told me that it was just what the academic market — high school and college teachers — needed to teach CA to their home design and drafting classes. Because of her efforts, my book is now used in home design classes throughout the U.S. She also got me hooked up with CA’s authorized academic dealers, who are marketing the book. I created a website, www.chiefapprentice.com, to help market the books, and plan to add an affiliate program as another method of marketing. This is a very selective market, so it’s important to get the word out that these books are available. If you have questions about the book, you can contact me directly at (253) 852-4022 or terrymunson2@msn.com. Thanks, Terry. If you’re a Chief Architect user or student, I strongly encourage you to visit Terry’s website, www.chiefapprentice.com, to buy his book, and please spread the word to any other Chief users you know. If you’re already familiar with Terry’s books, please leave a review here in the Comments to assist others who are searching for help with learning Chief Architect. Today I’m featuring a guest post from friend and colleague Kay Nordby, Owner of 3DPlanView. As you’ll see below, she has been working in the 3D design field for quite awhile and has a valuable perspective on the business. Kay is a very smart, talented, kind, and funny lady — and I’m proud to say that she was my teacher and mentor when I first started learning Chief Architect. There are some typical search phrases that visitors use to find my business, www.3dplanview.com: “I want to see 3D pictures of my floorplan,” “floorplans with 3D pictures,” and “3d floorplan.” Some of these people already have blueprints, while others are looking to purchase a set of blueprints after looking at 3D pictures. These folks want to see 3D pictures BEFORE they begin to build. I have been doing 3Ds for decades, and I have not talked to a single person who says, “No, I would rather NOT have 3D pictures of my home. I want the house to be a BIG surprise when it is done.” The problem comes when the cost is factored in. Folks are not required to have 3D images to build a home, like they are required to have a blueprint and permits. When it is time to cut dollars from the budget, 3Ds begin to seem like too much of a luxury. So who is willing to pay? Clients who are resistant in the beginning to pay for 3Ds quickly understand their value as soon as they see an area of their own floorplan. I have landed jobs because I provided a “tease” drawing. Give folks a taste for 3Ds and they most often want more. Those who have built a home before and know the cost of a change order are willing to pay. Those who are familiar with 3D software are also willing to pay, as they understand just how much time and effort it takes to generate a 3D rendering. Builders who are seeking an edge over their competition are willing to pay, and developers who are building multi-unit projects are often willing to pay for a fully decorated “model home” that they use to “pre-sell” and market each available floorplan. Still, my most grateful clients are the individuals building their dream home. Often they have been working with an architect, and they are disturbed when they find that 3D renderings will not be given to them with their blueprint. When their architect flatly declines to deliver 3Ds, these folks set out to get help. Often they come to me, frustrated. The architect is telling them to trust his vision. They are not clear on what the architect has shown them. Or they have their own ideas, but their spouse cannot grasp it. Nobody “sees” what the others are thinking. Then they get their 3Ds. More often than not, the clients do love the home their architect has drawn. They get on board with his vision. And some clients have even joked with me that the pictures have prevented divorce. One gal took it a step further and said the 3Ds prevented murder! CLEARLY she was more than a little frustrated with her hubby. 3Ds provide understanding. Understanding leads to peace of mind, ease of compromise, and a house design to love. Today I’m featuring a guest post by fellow Chief Architect user Chris Brown. Chris is a Design/Build General Contractor with his own company, Stone Castle Homes, in Republic, Missouri (contact Chris at chrisdbrown@att.net). His post today is directed mainly at builders and home designers who aren’t currently using 3D renderings in their work with clients. I find that dealing with most builders on the subject of 3D renderings (especially raytracing) is like trying to teach an old dog new tricks. Builders don’t want to do it because they don’t want to pay for it. When I design a custom home for a builder, the builder just doesn’t know how to talk to his client about the benefits of the 3D renderings, and therefore it almost never gets done. But when the builder allows me to talk directly to the clients and show them examples, the clients always want it. Seeing examples always changes a client’s mind, even if they’re not enthusiastic about the idea to start. When I show them samples from my previous projects, instantly, it’s “Yeah, we’ll pay for that!” They appreciate the value immediately of being able to see the finished product before the ground is even dug. In the olden days, plans were hand-drawn, just line drawings; even when CAD came along, they were still just line drawings for a long time. This leaves a lot to the imagination. But nowadays, 3D renderings provide the wow! factor – it gives clients the opportunity to actually SEE what their finished home will look like. Which do you think a client would rather see? This……. 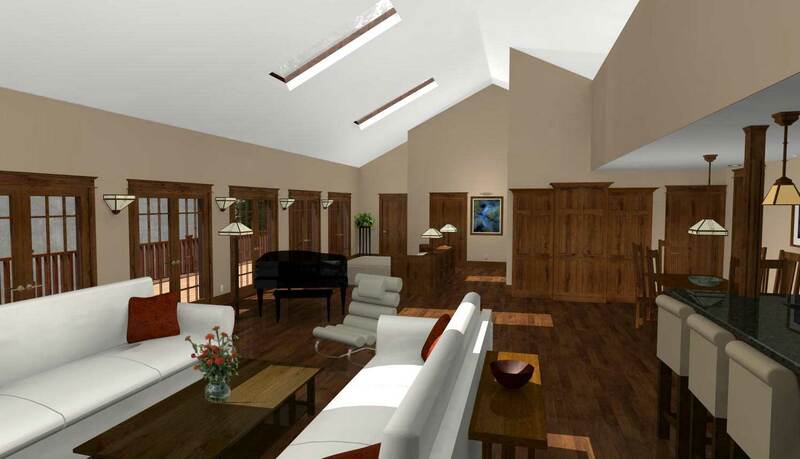 A builder today can make an extra $1,000-5,000 per house by using good 3D renderings. 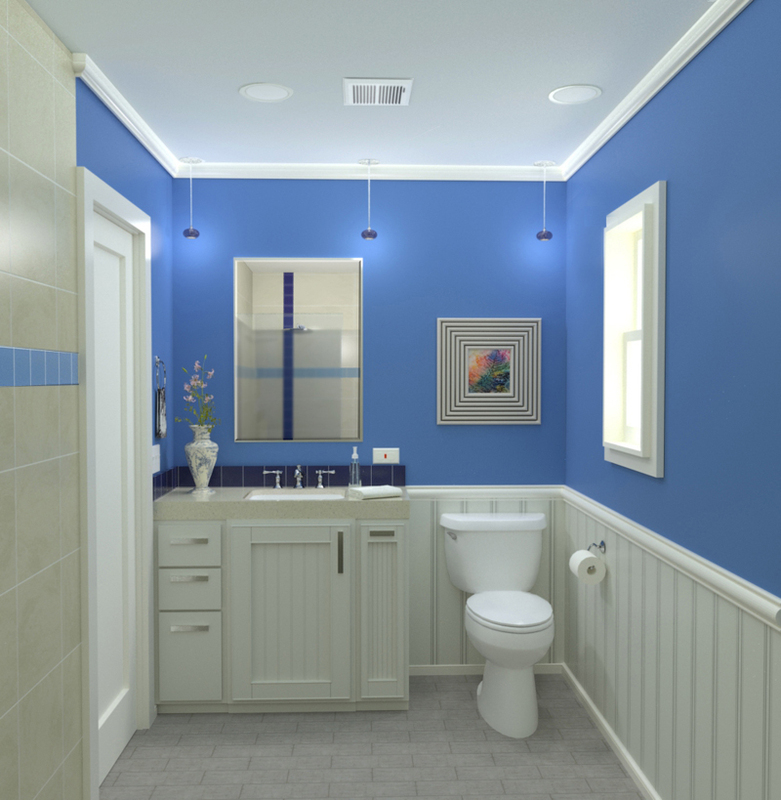 Renderings allow you to put in all the extras, like crown molding and granite countertops, right from the start, and let the client see how they will look. Once they’ve seen the top-of-the-line version, then their budget can dictate what to take out, rather than trying to do it the other way around. Builders can also use the 3D renderings for advertising – a sign on the lawn, brochures, website, etc. For Chief Architect users, if you don’t learn how to make nice raytraces, you are leaving money on the table. You’ve already done the work, made the 3D model, so why not make a little more money while providing a great service to your clients? Clients can even seek out a 3D designer first, before they meet with a builder, who can help them work out their ideas. Then they can bring the finished pictures to their builder. This is beneficial to both parties, because builders often don’t ask all the questions they should when trying to determine a bid, about the thousands of details that go into a project. Renderings give them something more definite to work from. In addition, with the economy the way it is, clients need to be even more sure they’re getting what they want, and 3D renderings are the most cost-effective way to insure that. “Seeing is believing,” and being able to see what their finished home will look like will inspire confidence. When a project is completed, I sometimes ask the client about their 3D images: “Was that worth the money?” And I’m sure you can guess what their answer is. Today I’m featuring a guest post from a 3D colleague, Patricia Abood, Owner and Chief Artist at 3D-Diva. Pat is a talented 3D artist who creates renders exclusively for users of Chief Architect software. The images below are examples of her work. Did you know that many photographs you see in a magazine or on a website aren’t really a photograph? How can you tell? Sometimes you can’t. It’s called 3D rendering. 3D renderings are computer-generated pictures taken from models or “meshes” built within a modeling software [like Chief Architect]. Lines and curves are drawn to form a geometry so when the computer calculates all the angles, it creates an object that you can visually walk around, look at from behind, above, and so on. While the computer works hard making the calculations necessary to create a 3D object, the 3D rendering artist also works hard to make sure the computer understands what he or she wants it to do — and that’s called creativity. I’ve actually had emails sent to me asking if I could “plug this diagram into a rendering program and make it look like 3D.” I try to hold my laughter inside, but sometimes I laugh out loud. I politely email back telling them that it doesn’t work that way, and that I have to actually draw their diagram in one program and then have another program generate the 3D image so that it will look like a photograph. Since I’m speaking to them via cyberspace, I unfortunately don’t get to see their look of confusion. So what’s the big deal about 3D, you say? What if I told you that you could visually see the room you’re thinking about redecorating before you even start stripping that 1980’s wallpaper? Maybe your husband wants the spare room for his man-cave, and his idea of decorating is an old recliner in the middle of the room with the flat screen TV as the focal point, a compact refrigerator for drinks, and a leftover cabinet from your last remodel hanging on the wall to store his chips. You, on the other hand, would like to be able to keep the door open to the man-cave when you have visitors. You have some great decorating ideas but can’t seem to get your point across. Let him see your design in 3D…. brilliant idea! Men seem to be a little less picky when it comes to decorating and usually let the women do as they please, but there comes a time when too much foo-foo can take the wind out of any manly sail. Collaborating with one another with 3D images can merge two ideas into one that both can agree upon. Of course I’m exaggerating, but even with the best design intentions, without 3D renderings you will never know what your idea will look like until the project is finished. Architects, designers, and draftsmen are all climbing on board with 3Ds, showing off their work with realistic images — but not just any 3D image. A professional who spends hours, days, and weeks creating a floor plan wants a photorealistic image that is an appropriate reflection of their own talents. It’s like the parsley on the potatoes — presentation! Presentation, as well as how a professional markets their designs, is just as important as the design itself. When I receive a floor plan from an architect, designer, or draftsman that was created in Chief Architect, I know how important it is for them to have a 3D rendering that reflects the hours they put into the design. The professionals give only their best to their clients, and a 3D rendering is a wonderful tool to display the best of their creation. So the next time you see a photograph in a magazine and wonder if it’s real or not, it just may be a 3D render. Thanks for sharing your thoughts and your images, Pat!